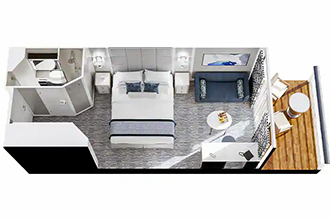 Stunning and sleek, the elegant 684-guest Insignia, offers every luxury the discerning traveler expects, including fabulous open seating restaurants, eight chic lounges and bars, a casino, lavish suites and luxurious staterooms, 70 percent of which have private verandas. 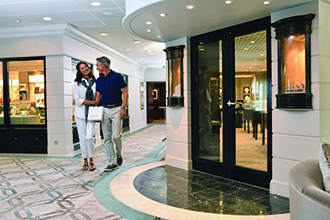 Custom stone and tile work in many of the public areas and decks of the finest teak add to the beauty of Oceania Cruises' stunning ship, with luxurious neo-classical furnishings. Boasting a high staff-to-guest ratio, you can expect the highest level of personalized service you are accustomed to. Have it all on this exceptional mid-sized ship, blending elegance and luxury with intimacy and warmth. 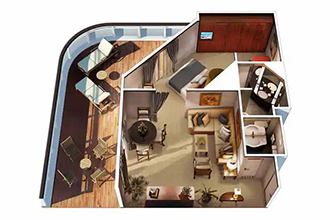 Ideally sized, the luxurious Insignia, sister to Regatta and Nautica, features all the ingredients for you to relax, including spacious suites and staterooms, a heated pool and three whirlpools, rejuvenating treatments at the world-famous Canyon Ranch SpaClub and exquisite cuisine. 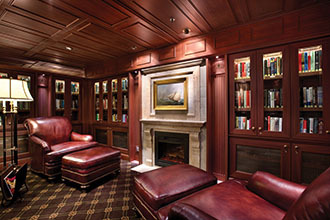 Shop for fine fashions and duty-free jewelry at stylish boutiques and read a best seller at the tranquil and elegant English-style Library, boasting over 2,000 books. Relax at Afternoon Tea which features traditional delights. Keep in touch with loved ones at the Oceania@Sea Internet Center, open 24-hours. WiFi access is also available. Play paddle tennis and take a jog on the fitness track in the delightful sea air. 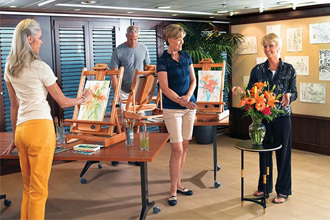 Enrich your cruise experience as guest lecturers speak about a multitude of interesting topics. 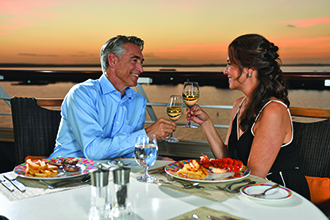 Enjoy some of the finest cuisine and dining experience at sea where your taste buds take an incredible culinary journey. 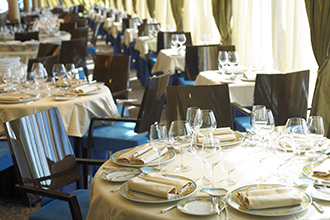 French-inspired Continental cuisine with a contemporary twist is featured at the elegant Grand Dining Room, sparkling with the finest silver, crystal and Villeroy & Boch china, evoking that of a 5-star restaurant in one of Europe's grandest hotels. Dine on authentic and delicious Tuscan dishes created from recipes handed down through the generations and complemented by exquisite wines from the region. Intimate and classic, the Polo Grill is a traditional steakhouse and also features a bar. Casual selections include the Terrace Café, with fabulous diverse buffet selections and Waves Grill, with a fabulous menu of seafood, salads and grilled favorites. Creating the ultimate in luxury cruising, spacious suites and staterooms feature an elegant décor of beautiful hardwoods, fine furnishings and art. Breathe the fresh sea air on your private teak veranda, featured on the majority of accommodations. Oversized living and dining rooms are offered in suites as well as marble and granite in the bathrooms. 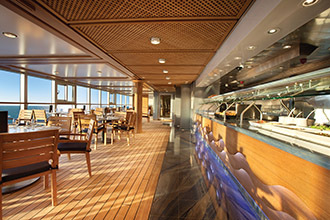 Palatial Owner's Suites, Vista Suites and Oceania Suites elevate cruise ship opulence to new levels. Wake up rested in your Tranquility Bed and enjoy the incredible views in your incredible home away from home. Watch first-run movies on your stateroom plasma TV and play DVD's and CD's in your entertainment center. 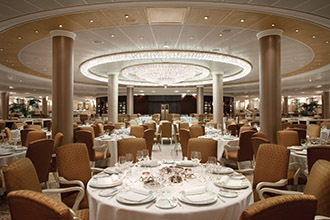 Musical evenings are offered on the Insignia, including the eight-piece orchestra, one of the finest at sea. Attend a live classical concert under the stars, jazz nights, disco and dancing at Martinis, exciting action at the Monte Carlo-style casino, plus a classical string quartet. 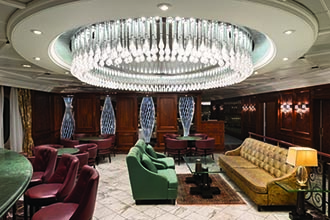 Relax at the convivial atmosphere as you sample a rare vintage at the Grand Bar, ideal for pre-dinner drinks and meet up with new friends over a cocktail in one of the many chic lounges. 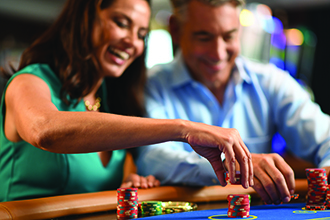 Exciting entertainment also includes performances in the Ship Lounge by comedians, magicians and headliners. 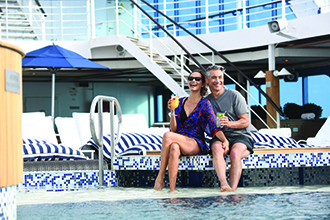 Cruise on the luxurious Insignia to worldwide destinations, including the Caribbean, Mediterranean, U.S. & Canada, Hawaii, Mexico, South America and Asia. These handsomely appointed 216-square-foot staterooms boast our most popular luxury – a private teak veranda comfortably furnished for watching the ever-changing panoramas. 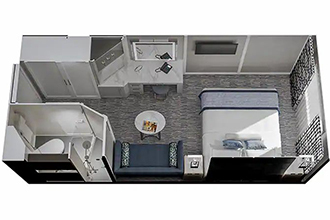 The conveniences within each stateroom are just as accommodating and include a vanity desk, refrigerated mini-bar, breakfast table and spacious seating area. 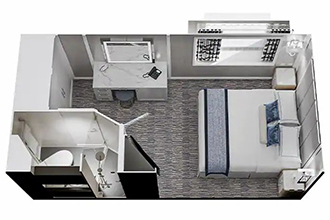 With the curtains drawn back and the natural light streaming in, these comfortable 165-square-foot staterooms feel even more spacious. A generous seating area, vanity desk, refrigerated mini-bar and breakfast table are perfectly complemented by the rich hues and stylish fabrics of the decor. 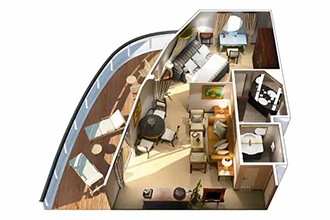 Centrally located amidships on deck 6, these comfortable 143-square-foot staterooms are awash in natural sunlight from the expansive window with obstructed views. 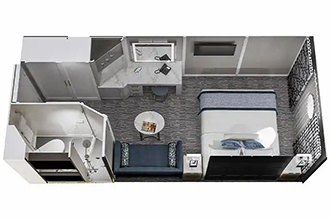 Features include a vanity desk with chair, a refrigerated mini-bar, a small breakfast table and an ample closet. Immensely spacious and exceptionally luxurious, our six Owner’s Suites are among the first to be reserved by our discerning guests. Spanning nearly 1,000 square feet, these magnificent suites are fit for royalty. 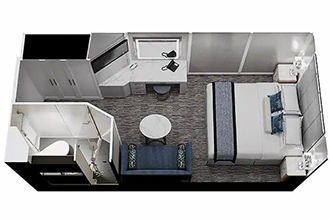 Every imaginable amenity is found here, including a private teak veranda, a second bathroom for guests, two flat-screen televisions and a laptop computer and iPad® for your personal use. 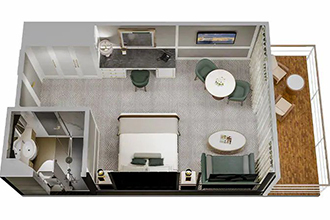 Our collection of elegant 322-square-foot Penthouse Suites features every conceivable comfort. Spacious and furnished for private in-suite dining, the living area features a refrigerated mini-bar and vanity desk, and the marble and granite bathroom is large enough for an indulgent full-size bathtub. Relax on the exquisitely furnished private teak veranda. Features: exclusive Tranquility Bed with 700-thread-count linens, private teak veranda, full-size bathtubs, butler service, refrigerated mini-bar, priority early check-in, priority restaurant reservations in Toscana and Polo Grill, priority luggage delivery, flat-screen color televisions, DVD player with over 300 titles, writing desk and stationery, grohe handheld shower heads, security safe , twice-daily maid service, wireless Internet access, handheld hair dryer, vanity mirror, direct dial satellite phone and cellular service, 110/220 volt outlets. 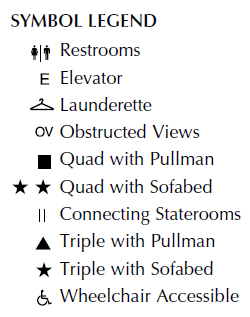 Named for their sweeping views over the ship’s bow, the four Vista Suites each sprawl over 786 square feet. 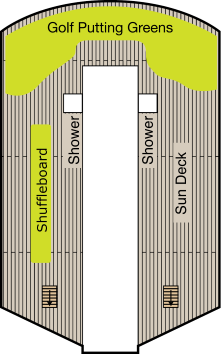 Every creature comfort is here, including a second bathroom for guests and private teak veranda. Listen to music in enhanced surround sound, or watch a DVD on one of the two flat-screen televisions. Access the Internet wirelessly on the provided laptop computer or iPad®. Handsomely decorated in rich woods, designer tapestry fabrics and oversized armchairs, the expansive dining area exudes classic splendor. The Grand Dining Room’s formally attired and classically trained wait staff graciously serve course after course of European-inspired cuisine or delectable alternatives such as healthy Canyon Ranch® signature dishes. As variety is essential, menus change daily with a brilliant choice of at least ten appetizers, soups and salads and twelve entrées at dinner. Informal and carefree, the Terrace Café is wonderfully inviting any time of day--feel free to dine inside or alfresco at one of the shaded teak tables on the terrace. First thing in the morning, enjoy sumptuous breakfast selections. Come lunch, the expansive menu of international-inspired dishes changes entirely, beautifully complemented by flavorful roasted and rotisserie meats and the magic of the pizzeria’s oven. Feel free to dine inside or alfresco at one of the shaded teak tables on the terrace. Evenings, the impeccably clad wait staff shines, and the cuisine takes on a more sophisticated flair. Lobster tails and lamb chops are prepared to order, and freshly made hand-cut sushi and sashimi await your selection. Tomorrow, an entirely different series of menus awaits the opportunity to delight you. In Italian, Toscana means Tuscan, and just as Tuscan cuisine evolved from rich family traditions, many of our recipes originated with the mothers and grandmothers of our own Italian culinary staff. Presented on elegant, custom-designed Versace china, masterfully prepared dishes exemplify the essence of Tuscany and celebrate Italy’s culinary passion. Perhaps the evening begins with an appetizer of Octopus Carpaccio with Champagne Vinaigrette or the Artichoke and Parmesan Cheese Timbale with Black Truffle Sauce. Classic dishes from other regions of Northern Italy are featured as well, such as the Minestrone alla Genovese, Lasagne al Forno alla Bolognese and Osso Buco alla Milanese. 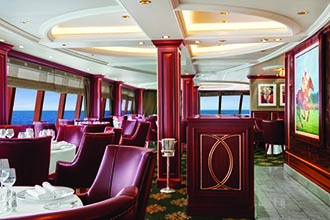 Sometimes, the ultimate luxury is casual dining on all-American favorites, a style laid-back Waves Grill epitomizes. Located in a spacious, shaded area steps from the swimming pool, Waves Grill offers an extensive and mouthwatering luncheon menu as well raw, cold-pressed juices, vegan smoothies and healthy energy bowls during breakfast at the new Raw Juice & Smoothie Bar. During lunch, the chefs grill gourmet burgers, tangy barbecue and succulent seafood to order in the open galley, accompanying them with side dishes like garden-fresh salads and crispy, hand-cut truffle fries dusted with grated aged parmesan. Travel to the most remote, exotic lands and never be out of touch. The Internet center is open around the clock so you can stay connected with loved ones through email, check the latest business news and stock prices, or research your next port of call. 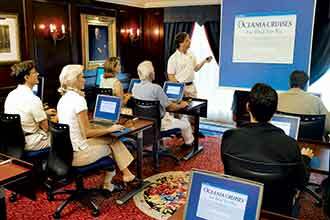 Discover a legendary spa experience aboard Oceania Cruises. Award-winning Canyon Ranch – with its family of destination health resorts, hotel, wellness communities and SpaClub facilities – has been the acknowledged world leader in healthy living expertise, and a haven of luxury, comfort and warmth for 30 years.